The pace of cost-cutting reforms peaked in 2011, when 134 state and local government plans made some type of cuts that year. They run the gamut from increasing the tenure requirement or retirement age applied to new employees’ future pensions to trimming the cost-of-living adjustment on all pensions. To gauge their impact, the researchers used U.S. Census Bureau interviews to follow individuals’ employment movements from one year to the next. They then looked at the average private-sector wages of both the new government recruits and the people who’d left the public sector. The thinking behind their approach was that pension cuts might discourage private-sector employees with their relatively high wages from switching to public service. On the flip side, the pension reductions might also make it more difficult for the public sector to keep its own highest-paid employees, if, by migrating to the private sector, they could increase their pay. It turns out that the impact was on the recruiting side. Pension cuts “appear to reduce the ability of public-sector employers to compete with the private sector,” the researchers said. What helps (?) is that most people have very little idea of the efficiency of pensions, how pooling longevity risk and distributing sequence of returns risk across cohorts affects that amount of income that can be generated from a given amount of payroll. Instead, the problems that plans have encountered (not least from suspending employer contributions when returns were good) are given to suggest that pension plans are inherently unstable. Were that the case, there could be no insurance industry. Pensions are all well and good, but things like the California Rule that allow elected officials to hand out retroactive enhancements and, when fiscal disaster results, do not allow electeds to fix the problem by reversing the retroactivity or even changing accrual rates prospectively. Further, they stick taxpayers with the bill, creating huge unfunded liabilities (which, ultimately, are funded by taxpayers in higher taxes or fewer services). I don’t think most would take issue with reasonable pensions (and NOT 90%+ of final, highest year of pay with automatic COLAs of 3% per year, for example), based upon realistic rates of return assumptions, reasonable retirement ages (NOT 50 when people are living 80+ years), and with risk (cost of unfunded liabilities) shared equally between employers and employees. Choices between traditional pensions and more flexible options (such as a 403b or 457-style plan w/matching) for those who want to spend SOME time in government but not an entire career, should also be available to employees. Finally, we need to get rid of the California Rule that makes zero sense. To say that you can give retroactive increases but cannot take them back when you find out they are unaffordable is absurd. Ken, there is much to be said for defined benefit pensions as risk sharing mechanisms and Shane, there are very serious problems in how pensions are now operated. Only if issues can be resolved, such as those raised by Shane, will the case by Ken be persuasive. I would add another fix: Where many pensions only consider earnings over the highest few years, Social Security considers the highest 35 years (and thus is much less subject to being gamed). The Social Security approach, if implemented for public and private pensions generally, would reduce the problems of people switching jobs. After, in many cases, retroactively enriching pensions for those cashing in and moving out, most of those “pension cuts” have been for the new employees governments need to attract. In NY this “screw the newbie, flee to Florida” cycle has happened several times in 50 years, leaving behind sky high labor costs for jobs only the unqualified will take. When you average in older, new AND retired public employees, the total compensation of state and local government workers is is soaring relative to the serfs who pay the bills. Bureau of Economic Analysis data here. New York may be an outlier, the place where the unions have been most unjust and everyone else, the most ripped off. Other places, Arizona for example, may be the opposite. 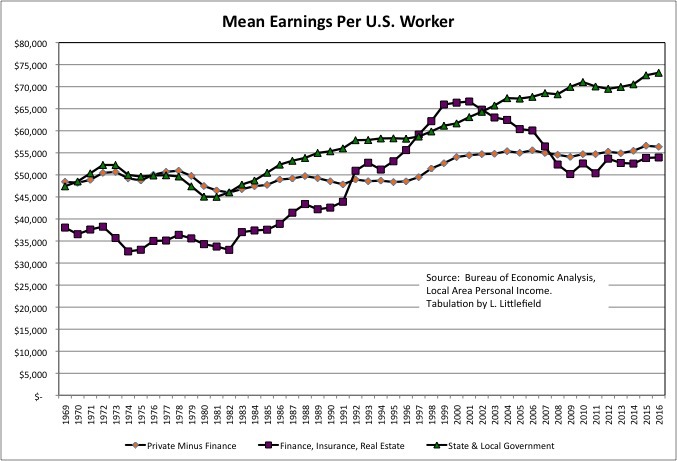 But this chart shows the national average for total earnings (wages and benefits) per worker in the U.S.
Long ago I read that popular benefits, like pensions, health coverage, and vacations were a result of wage freezes mandated by the Office of Price Administration in the years following WW II. Employers couldn’t offer higher salaries so they used these benefits to “sweeten the pot” and attract more job applicants. I live in NJ, the state with the highest property taxes in the U.S. The single biggest line item on my tax bill, at 63%, is for education. 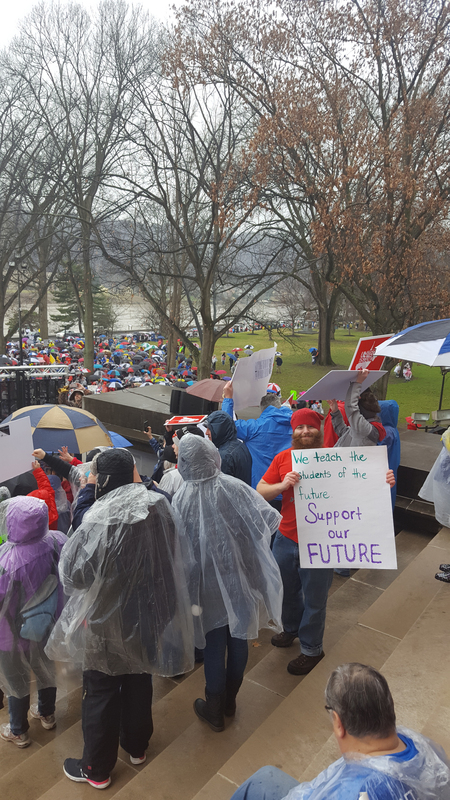 Teachers here have a very strong union and enjoy benefits most of us can only dream of. I am in favor of honoring deals already made but feel it’s time to re-write the book for new hires. 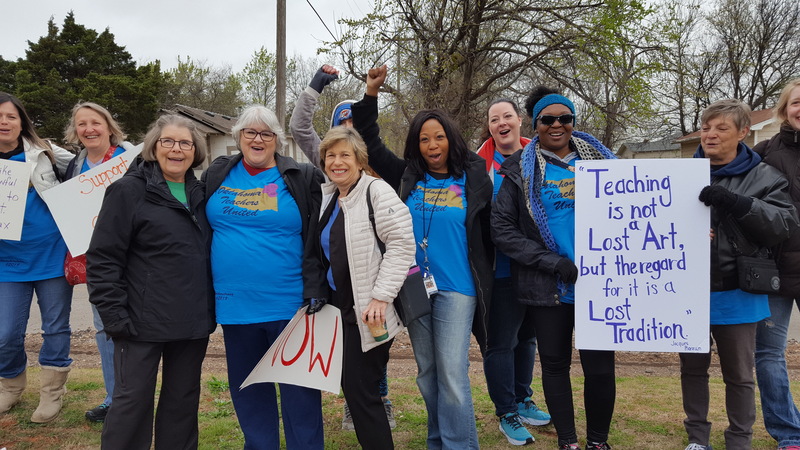 Educators tell me there are lots of unemployed teachers out there, and stories of grad students working in the fast food industry are common, possibly because school districts are reluctant to hire, given the costs and responsibility of providing (sometimes) lifelong benefits. Defined benefit plans require a work force of a large, stable size. One factor in the decline of defined benefit plans in the private sector is that there are fewer really large companies in terms of number of employees. The new governor in N.J. wants to raise taxes, not do anything about the unsustainable benefits generously bestowed at the taxpayers’ expense. The pension fund is so underfunded, it may have the largest liability in the nation. It’s in crisis mode. The politicians know it can’t last but don’t care. Just tax more and line their pockets. My husband and I have to pay a startling amount for our health care premiums which rise the older we get, and no pension benefits. In addition, we also have to pay for the state employees benefits. In addition to the highest property taxes, we also have a high progressive income tax system. Talk about inequality. Repeal WEP & government pension offset!!! In 15 states, teachers don’t pay Social Security. That means widowed teachers can’t receive their survivor benefits. Support HR 1205, S 915, HR 1902, and POWR HR 1583! As Kevin Brady says: time to correct the math!! !